We are living in a land of pancakes, pastas, pizzas and tacos. Eating out is fun here.. excellent variety of exotic food for us. But at times, we do miss our Indian favorites. 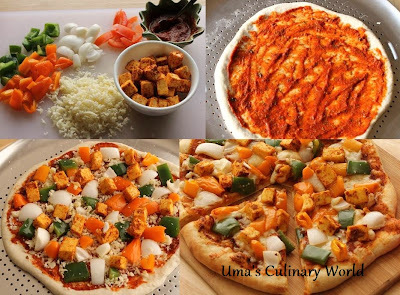 The list of such food items is quite big... Pani Puri, Samosa, Kachori.. for now, lets taste an Italian pizza with a desi tadka.. Tandoori Paneer Pizza a.k.a Paneer Tikka Pizza. In a large bowl, add yeast, sugar and 1 cup warm water. Let the yeast turn foamy, about 5 - 8 minutes. Add salt, garlic powder and all purpose flour. Now add 2 tbsp oil and knead to form a soft dough. Knead for about 5 minutes, until it turns elastic. Apply 1 tbsp oil to the dough. Cover the dough with plastic food wrap. Let the dough rise in a warm place, until it doubles, for about 2 hours. Punch down the dough and knead once again. Cover the dough with plastic food wrap and let the dough rise again, until it has doubled, about 45 minutes. Punch down the dough and use it for preparing pizza at once or freeze the dough for later. In a mixing bowl, add lemon juice, 1/2 tsp Tandoori Masala, chat masala, 1/2 tsp cayenne pepper and salt to taste. Mix well and add paneer cubes. Coat the paneer well and set it aside for about 30 minutes. Instead of lemon juice, you can use thick yogurt/curd/dahi as well. In a mixing bowl, add tomato paste. Add grated (or finely chopped) ginger and garlic. Add 1 tsp Tandoori Masala, 1/4 tsp cayenne pepper and 1/4 tsp fresh ground black pepper. Crush kasoori methi leaves between your palms and add that too. Add about 1/2 cup water, salt to taste and mix all the ingredients well. Grate Mozzarella cheese as much as you want. Finely chop cilantro leaves. Dice bell peppers and onions into big cubes. Preheat the oven at 450 degrees F. Roll the pizza dough using a rolling pin. Dust some flour if required. Sprinkle some corn meal and place the rolled pizza dough and slightly press so that corn meal sticks. Place the rolled pizza on a baking pan. Brush the rolled pizza all over with oil. Make dents with your fingers so that pizza does not puff up in the centre. Apply Tandoori Pizza sauce as much as you like. Top it with grated cheese and finally with marinated paneer and veggies. Bake for 15 - 20 minutes or until cheese melts and pizza edges turn golden brown. Also, check out some more varieties of homemade pizza - Vegetable Pan Pizza and Whole Wheat Tandoori Chicken Pizza. Wish i get a slice,yummy.